Online ticket sales have ended but you can still purchase General Admission tickets at the door on Friday. Congratulations to the winners of our free ticket contest! 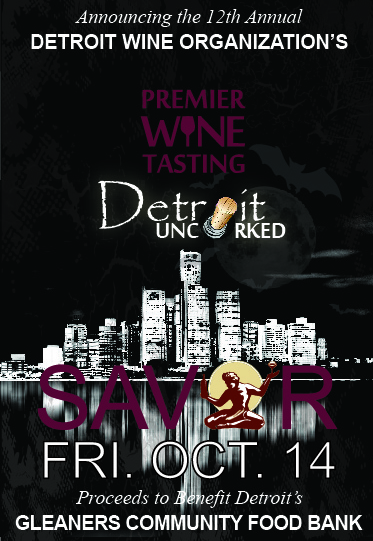 The 12th annual Detroit Uncorked premier wine tasting is returning to delight the Greater Detroit community on October 14, 2016 from 6-9 p.m. at Gleaners Community Food Bank, 2131 Beaufait, Detroit, MI. Detroit Uncorked is one of Southeast Michigan’s largest wine tasting events and this year is no exception, featuring more than 250 world class wines, Michigan handcrafted beers and premium spirits. The Detroit Wine Organization’s 2016 Winery of the Year Award will be presented. Your VIP ticket purchase will provide healthy meals for our most vulnerable, helping them stabilize and secure a brighter future. Every early ticket purchase provides 390 meals for a neighbor in need! Join more than 800 fellow wine and food lovers at the 12th annual Detroit Uncorked! Early General Admission ticket purchase will provide healthy meals for our most vulnerable, helping them stabilize and secure a brighter future. Every early ticket purchase provides 225 meals for a neighbor in need! Join more than 800 fellow wine and food lovers at the 12th annual Detroit Uncorked!